Feature Canvas: How to Start Working on a New Feature. Sometimes when we get a description of a new feature (or new idea about how to improve our product comes to our mind), we start working on concrete solution. Or even start polishing small details of this solution. In other words we jump fast from so-called “problems area” to “solutions area”. Yes, we can understand initial user problem, which should be solved by new feature. But all problems have their root causes (and that is what sometimes missed). It’s also important to think about usage context, because it can create new (even small) problems. And of course we must think about real value proposition which we are going to deliver to our users. Altogether, there are quite a few things that we forget about. Not always deliberately or out of ignorance. Simply there are a lot of features in our backlogs, development pace in very high. As a bonus, I’ll show you how to use this technique in a “wildlife”, i.e. not only for product features but for different “non-digital” ideas. Nikita has over 11 years of experience in Software Development area, including positions as a Head of UX and Senior Product Manager. During this time he has worked both at product and outsourcing companies on different projects: from compilers to mobile apps with augmented reality. He has a strong experience in UX, user research and product management. Nikita is also a UX coach for more than 4 years. 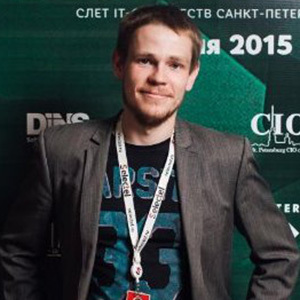 He is an experienced speaker and organizer of several conferences in Russia, including World Usability Day, World Information Architecture Day, ProfsoUX, and SECR.